These are only a few signs of the end of the world, as we know it, they signal the time approaching of the changes to occur on Mother Earth that bring a period of purification. Many Sun Dogs will be seen around the time of the White Buffalo and this will be a Sky message that foretells that the Secret Sacred Teachings are now to be shared with all races. There will be enough awakened ones to carry the responsibilities of these teachings and the great healing of human kind will be in full swing. At the beginning of this cycle of time, long ago, the Great Spirit came down and He made an appearance and He gathered the peoples of this earth together they say on an island which is now beneath the water and He said to the human beings, "I'm going to send you to four directions and over time I'm going to change you to four colors, but I'm going to give you some teachings and you will call these the Original Teachings and when you come back together with each other you will share these so that you can live and have peace on earth, and a great civilization will come about." All of the signs have made their appearances; all have come to pass. We are in the shift. The time of “no time” is upon us. The age of the Sacred teachings is upon us, let us share. Make way for Creation is shifting, all illusions, the veil is finally lifting. 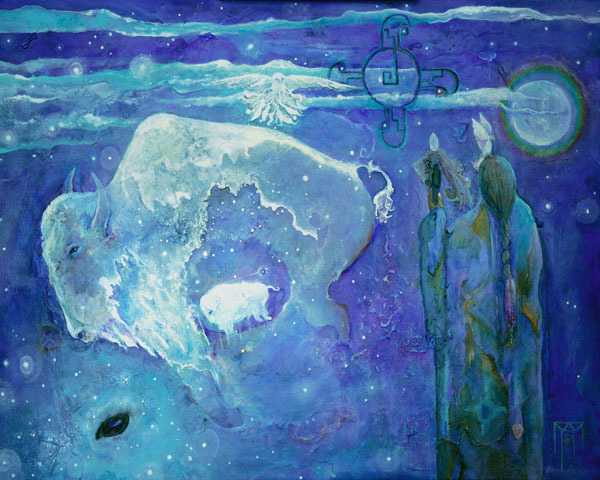 The painting of “Blue Star PeTanka” is a message to the people who are ready to look, see, to hear and listen to the ways of the ancient seers and what they had to say, a spark they share to light our way. Perhaps, to awaken we, gaze as we will into the eye of the Buffalo, the portal into the void, the place of pure potential that existed before the universe was created. A medicine woman stands in gratitude and reverence under the mysterious cosmic night sky with her Star Nation family. She holds her medicine staff, which anchors her here and connects her there. She wears her medicine robe of sacred symbols beneath the cosmic rainbow moon and the white dove of peace lands from flight returning to her crown with messages of a new land found. The emblem above her head in the clouds is an ancient symbol of Lemuria. This cross tells us that all Forces throughout the Universe have their origin in the Divine. All of the arms of the cross are symbols of the Primary Forces emanating from the Creator. It is said by the ancients to be Creators commands. The Four Great Primary Forces are all working in a circle from a center and proceeding in an Easterly direction, thus causing the whole Universe to revolve from West to East and all living moving spheres to revolve on their axes from West to East. The mysterious images they are meant to awaken a memory where you fall back into the silence between the worlds, something sacred is about to be born. 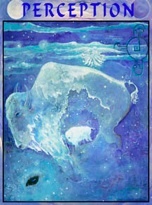 In the painting there is the spirit of the White Buffalo in gestation readying to birth abundance into the new world. The hue of blue denotes wisdom and reflects the cosmos’s of non-linear time and space communication. The white owl flies in and brushes her wing through the symbol of creation to spin the wheel round again as all is in constant motion. The world is seen through different eyes, you see one thing and someone right next to you can see something completely different. This happens all the time, everyone sees through his or her own eyes. Being with the energies of the Full Moon, is a time that supports release and allowance for the intelligence of the concept of clear perception to speak and reflect into all the facets in the diamond of our lives, bringing peace and illumination. The world reflects like a mirror into our soul. Every earthly perception we have whether or not we focused much on it or not, is a library or a records hall for information. There are infinite images recorded and perhaps most of these are in our unconsciousness, (that can be scary). An ordinary mirror simply reflects back what it has been given, but of course the mirror to our soul has a far more multifaceted and transformative prospect. Through conscious awareness we can make our intention to break through and transmute the perceived negative image into a spiritual essence. Really what we are doing is polishing the mirror, so that the images are reflected back to the world as a shining spiritual light. When we meet these reflections with prejudice and clouded perceptions, we cast a dark negative shadow on the images and then these are created. When we meet them with loving detachment, we add to the images, the light of our higher power. Then these enhanced images are reflected back into the world in a new way enhancing our personal understanding and humanity as a whole. As we awaken our awareness, our way of perceiving expands out past the boundaries of the thinking mind. We are remembering that we are the keepers of intention, and intention sets the direction on our path. The only path that leads to awakening to the higher beauty of Creation is the heart. The old ego reality is nothing more than a faded dream. The world will morph to manifest a perfect theatre for our new paradigm and as we look around our brothers and sisters will reflect a similar Spirit Light, emanating beautiful peace, a new rhythm and celebrate the Eternal Dance of Creations’ existence. The Sun Dog is our Mother Earth and Father Sky’s gentle way of communicating a profound message to us. It is a message that cannot be censored and it will get our attention to look up above. Have faith in the Wisdom of Creation. There is nowhere to hide from Consciousness. It is the Ultimate coordinator of our existence. Trusting in our journey within Consciousness is the only way. If there is fear, it is just a place inside that lacks love. Love is what Consciousness intends for us. It is the relationship we have with this Truth, with our Self. It is all that IS and our collective input will influence what is to be our new reality. “No thing living will go untouched, here or on the heavens. The way through this time it is said is to be found in our hearts, and reuniting with our spiritual self. Getting simple and returning to living with and upon the Earth and in harmony with her creatures. Remembering that we are the caretakers, the fire keepers of the Spirit. Our relatives from the Stars are coming home to see how well we have faired in our journey.” Hopi elder.